Early Times is Chicago’s chimney experts – including chimney repair. Get a free quote and join thousands of other happy homeowners. The fact is that over time your chimney will begin to wear down. It’s a slow process but could be a problem for older homes that have their original chimney. While it sounds expensive, chimney repair is a must for many homeowners and they don’t even know or want to acknowledge it. There are many different chimney repair companies, but the most trusted one in Chicagoland is Early Times. Whether it’s mortar problems, cracked bricks or an internal problem, we specialize in all types of chimney repair. It all starts with a chimney inspection to find out what the real problem is. Some small problems can be as easily fixed by a chimney cleaning while others will need more extensive work. It’s important to find the problem early on before it gets real bad. We recommend having a chimney inspection at least once per year. Chimney repair encompasses many different topics. Each part of your chimney needs specific attention in order to maintain it. For instance, chimney flue repair focuses on the chimney flue. Whether it’s dirty and needs cleaning, or the duct is completely broken, there are many things to consider with chimney flue repair. Your fireplace damper is another piece that has specific problems you need to look out for. Chimney damper problems can include it not closing or warping due to its exposure to heat over the years. There are also two types of dampers: throat dampers found just above the firebox and top sealing dampers found at the top of the chimney. 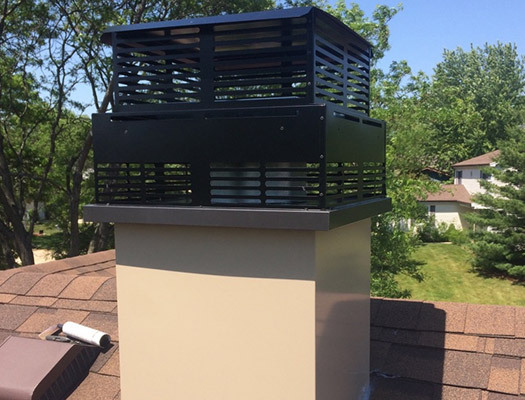 The crown of your chimney is the top part of the chimney that seals the flue liner to the chimney edge, preventing water from getting into your chimney. Chimney crown repair is needed when it starts cracking, and splitting. Your chimney cap is the piece that’s found on top of your chimney. They usually have a steel wire mesh which makes them easy to spot. Your chimney cap prevents water, downdrafts and animals from getting into your chimney. If it’s broken and allows any of these things into your chimney, you have a problem. If the cement piece that the cap fits into is broken, it can be fixed with a little masonry work. Chimney tuckpointing is also part of chimney repair. Tuckpointing is the repair of mortar between bricks. Overtime it can crack, crumble and turn to dust. This weakens the integrity of your chimney. Having a trustworthy company replace the mortar should guarantee at least a 50 year lifespan. Why is Chimney Repair so Important? It should go without saying that chimney repair is important. If problems go unnoticed or ignored, they will only get worse. Each broken part of your chimney leads to more problems if nothing is done. For example, if you don’t fix your chimney cap or mortar, water will be able to leak into your chimney, damaging the liner, your fireplace and the floor inside that surrounds it. A simple chimney inspection once per year could catch this problem and prevent it from becoming much worse. Same can be said about your fireplace dampers. If they’re stuck open, you’ll constantly feel a cold or warm breeze in your home and you’ll start to see your energy bills rise and your attempt to regain control of the temperature in your home becomes an uphill battle. If it’s stuck closed, it’s unsafe to use your fireplace because all of the smoke will be stuck inside. Depending on the level of damage involved, you may need a complete chimney repair. Luckily, Early Times is very experienced in chimney rebuilding. If there are multiple problems with your chimney that cause it to be unsafe to use, we’ll tear it down to a solid or structurally sound area and build it back up. Our certified technicians will be able to restore your chimney back to new. There’s one trustworthy chimney repair company in Chicago who’s been helping homeowners for over 30 years and that’s Early Times Home Solutions. We’re chimney experts who have even been recognized by the Chimney Safety Institute of America – that’s no small honor. Whether it’s a chimney cleaning, chimney inspection or any kind of chimney repair, we have you covered. Our experts are trained and know everything there is to know about chimneys. We pride ourselves on keeping Chicagoland homes clean and safe and will continue to do so for years to come.